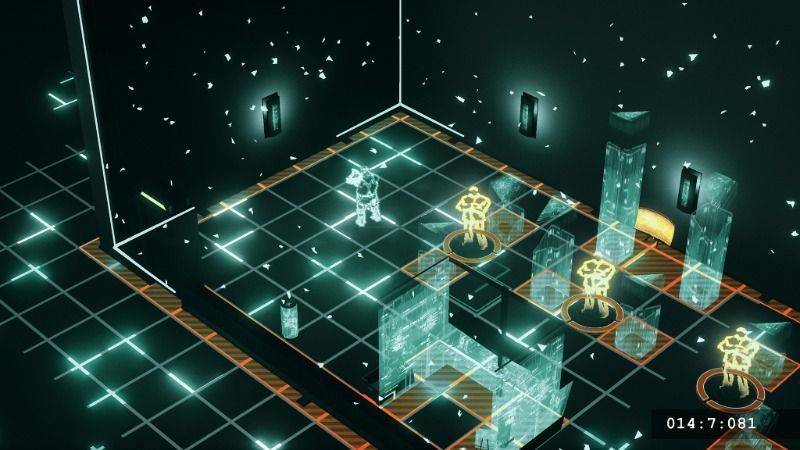 All Wall Must Fall is a tactics game that takes place in a future Berlin that is still stuck in the Cold War. 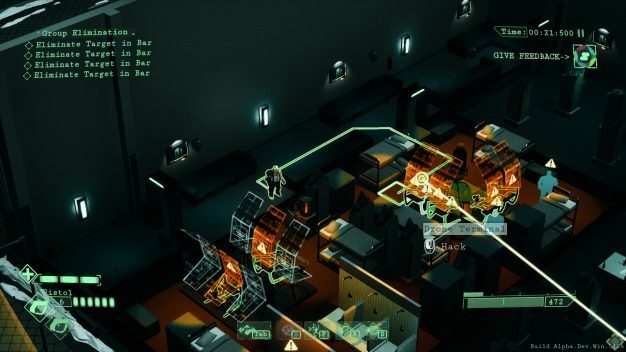 You play as an agent that is tasked with completing missions for a seemingly all-knowing agency. The first mission is simple, enter a club and kill a VIP. It’s in the execution of this task that the game really shines. Movement is done by clicking on a direction. The game slightly reminded me of my time playing Runescape. The action also takes this wait-and-see approach. Bullets only come flying at you while you are moving or attacking so motions need to be planned carefully less you be riddled with bullets. The point-and-click controls make this game challenging as we as frustrating at times. The action is meant to be thought out. If you just run into a situation, you will end up dead seeing as your guy can take about three to four bullets before dying. Damage also doesn’t seem to heal, so if you take damage in a previous encounter you will carry those wounds into the next encounter. You may be thinking is that the simple answer to this is just to go slow, but this is the point where I mention that the missions are also timed. Managing that stress of choosing when to go slow or fast is all part of the fun that is All Walls Must Fall. Levels are randomly generated with your objective being in a different part of the area every time you load in. Your agent has a host of abilities that can be unlocked to make your mission taking easier. One such ability is called Rewind. Rewind, much like the name suggests, allows you to rewind time. However, while everyone else is going back in time around you, your agent stands completely still. This is very useful when enemies are triggered and you need a little more time to finish the objective. 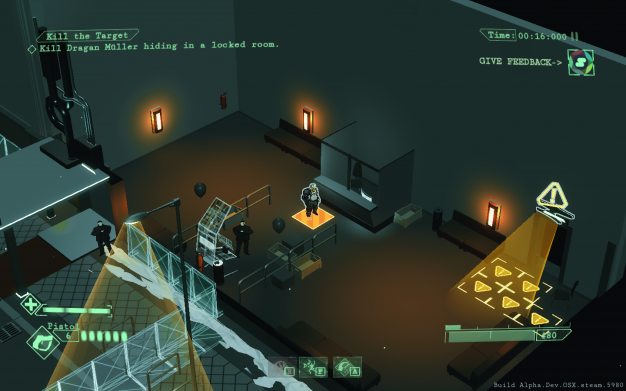 All Walls Must Fall has an almost haunting allure to it. The art style combined with the setting paints the picture of the world that has descended into madness and debauchery. Your character, an unlikely hero, doesn’t seem to have much control over the situations he is placed in.Walking into missions he is tasked with, eliminating targets, defusing bombs, interrogating targets, and whatever else his elusive mission handlers tell him to do. 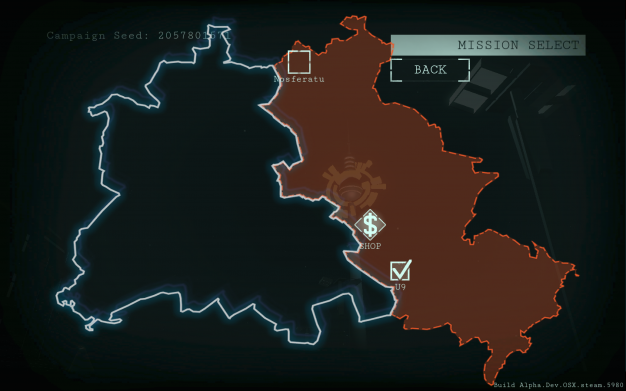 So far All Walls Must Fall is very promising. The setting is attractive enough for me to want to spend some time in that world. My only gripe so far is that I feel the setting is being wasted. I don’t really know why I was doing what I was doing. Why did my target need to die? Why were bombs planted in a club? Why are these club guards so heavily armed? I hope developer Inbetweengames answers these questions in the final release of All Walls Must Fall, but even with the lackluster story, the gameplay gives the game a fantastic start thus far.